Everything about the formation of powder-based super food Soylent reads like your typical start-up story. After failing to nutritiously fulfil their lunch cravings while beavering away at one of their many burgeoning tech-based businesses, founder Rob Rhinehart and co-founders Matt Cauble, John Coogan, and David Renteln realised that there was a significant gap in the market for a nutritionally balanced meal in a bottle. An initial crowdfunding campaign in 2014 raised almost $1.5million and the rest, as they say, is history. But as is the case with many seemingly excellent ideas, numerous brands have come along with a similar space food mentality and the World Wide Web is now awash with brands that claim to offer every nutrient a human needs in an 'easy-to-mix' powder or ready-made drink format. But what the hell are they made of? What on earth do they taste like? And are they actually any good? Lucky you, because we magnanimously parked the bacon baps for a week and sampled a number of these products in order to get to the bottom of this foodie fad. Plus, we've enlisted the help of some nutritional experts to tackle the science bit and offer their thoughts on these products that claim to offer a healthy and convenient answer to a Pret sandwich (no disrespect to a Pret sandwich). Arguably the first nutritionally complete liquid meal to strike a chord with customers, Soylent was produced to offer a convenient and healthy meal option for time-starved individuals. Seeing as it's also a vegan and nut-free drink, the recipe uses plant-based protein to ensure less water is used and less CO2 is produced compared to protein derived from livestock. It also has a massive shelf life (typically a year), so it attempts to address the issue of food waste. Where's that Nobel Peace Prize? Soylent CEO Bryan Crowley says: “For many of us, a busy lifestyle means it’s hard to get the nutrition we want, despite good intentions. Falling back on bad habits of skipping meals, snacking on junk food or eating nutritionally sub-par foods can become the norm as we struggle to maintain a healthy balance. At Soylent, we call these occasions ‘food voids’ and we’re on a mission to make these obsolete for consumers everywhere”. The name Soylent apparently takes inspiration from a soya and lentil-based food product from 1966 science fiction novel Make Room! Make Room!, but some critics have been keen to point out that in the 1973 film adaptation Soylent Green, the grub is made from human remains. Which is gross. Ready-mix Huel: Is it any good? That's a great question, because a quick scan of the ingredients list doesn't really shed much light on the topic. According to Soylent folklore, founder and former software engineer Rob Rhinehart popped to his local library and devoured a few biochemistry books to come up with a list of nutrients essential to human survival. From this shortlist, he then purchased a bunch of chemical ingredients, including the likes of potassium gluconate, calcium carbonate, monosodium phosphate, maltodextrin and olive oil to create his concoction. The final recipe features much of the above, as well as soy protein isolate, high-oleic algal oil, isomaltulose, canola oil, rice starch, and oat fibre, to be precise. Mix this all together with a variety of flavour enhancers to make it taste better, and you have a complete meal in a bottle (powdered form coming to the UK soon) that boasts 20g of protein and 26 vitamins and minerals. That really depends on how advanced your palette is and how willing you are to sacrifice flavour for convenience, because these drinks aren't exactly a joy to guzzle. Available in Cacao, Cafe Mocha and Original flavour, the liquid meals do an average job of convincing the taste buds, while we personally think the cacao chocolate offering is among the best of the bunch. However, there's still a slightly bizarre aftertaste that follows every sip and the texture can only be described as a cross between a Frijj milkshake and some very thin porridge. We can only speak from experience, but we have to admit the drinks also made us feel a bit bloated afterwards and, to put it politely, friends and family were scanning Amazon for gas masks after the first few days of sampling the stuff. "It's very difficult to accept the claim that a drink can offer a 'complete blend of everything the body needs'", explains Jack Derbyshire, Osteopath and healthy living expert at London's fitness-based clinic Body Tonic. "Even when a product claims it only deals with natural ingredients, like those seen on the back of Huel, they still tend to add thickeners and thickeners can just be another term for sugar. "I wouldn’t be adverse to turning to a powdered product or prepared drink as a meal substitute for practical reasons on occasion, but I would never recommend these drinks as a replacement for a proper balanced meal," he adds. We have written extensively on these very pages about life with Huel, spending weeks blending the powder with water and downing the stuff at lunch and replacing the occasional meal to see if it's actually any good. Newsflash: it is no way near as enjoyable as a tasty, well-balanced meal (go figure) but the ingredients list makes for much easier reading than some of the rival products featured here. "Huel is a nutritionally complete, convenient, affordable and 100% vegan solution for the time poor,” says Julian Hearn, Huel's co-founder. "One in four British adults today are obese, which all comes down to our easy access to unhealthy convenience food. "Humans and their ancestors have, for most of our history anyway, not had a consistent source of food. But today, instead of eating only what we can find, we now eat what we want, when we want, with the only limiting factors being time and money," he adds. And blam! This foodie visionary has started a craze that seems to be gripping office-based workers all over the world. According to its maker, all of Huel's ingredients are 'ethically sourced' and it's 100 per cent vegan friendly. 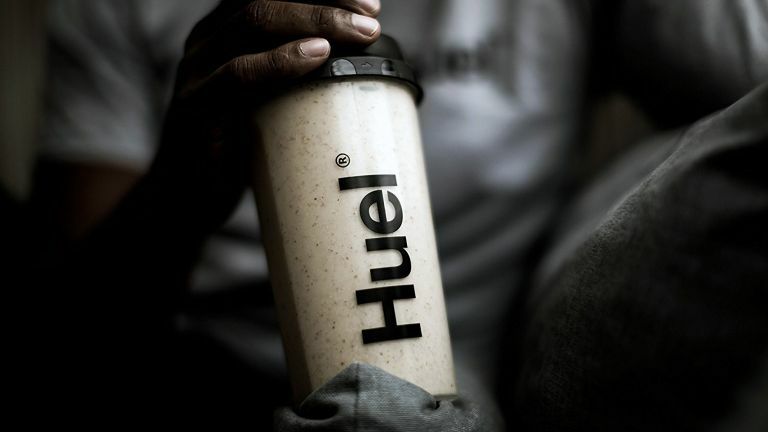 As a result, Huel has sold over 15 + million meals worldwide since it launched in 2015 and turned over £14 million, with that number set to grow thanks to the launch of a ready-to-drink product. Oats, pea protein, flaxseeds, brown rice protein, natural vanilla flavouring, MCT powder (from coconut) and sunflower oil powder make up the bulk of the basic ingredients, while Xanthan Gum and Guar Gum are added to create thickness and additional flavouring and Sucralose gives a little sweetness. A special Micronutrient Blend, which aims to hit all of the key vitamins and minerals required for a healthy, functioning body packs a bunch of potentially scary-sounding additives that are typically just a chemical form of vitamins and minerals. Available in a variety of flavours (vanilla, mint chocolate, berry and coffee), Huel also offers a variety of booster packs that are spooned into the mix and blended to suit tastes. Because of this, it's easy to find a flavour combination that makes it slightly more palatable, while conversations with Huel converts reveals that everyone seems to have a very differing opinion on what flavours work best. Still, it has the texture and consistency of gruel when shaken by hand. Although running it through a powerful blender (a NutriNinja, for example) does make it slightly smoother and leaving it in the fridge overnight improves things further. Again, the heady mix of oats, pea protein, flaxseeds and brown rice can take its toll on the stomach, especially for those not used to cramming so much fibre into the diet, so beware the dreaded flatulence festival some users report suffering from. Joanna Blythman, an investigative food writer who has written five books on the food industry, took a fairly negative stance in this piece for The Guardian. “There is almost nothing in there (Huel) in its natural form. These are very, very technologically altered hi-tech ingredients. They’re the opposite of what whole, natural foods are. If I read that list of ingredients on a product on a supermarket shelf, I would have a major problem. “Look at the eighth item on the ingredient list. It’s called a ‘vanilla flavour system’. I mean, seriously, what is that? It’s not vanilla extract or vanilla pods or vanilla grains or even vanilla essence. You are talking about the very rarified regions of food processing and industrial food chemistry where basic ingredients are being mucked around with and transformed. There are these very intense chemical sweeteners in there. There’s sucralose; that’s something like 200 times sweeter than sugar. There’s maltodextrin – that’s another sweetener. And xylitol – that’s another one. It’s all just rubbish. And then there’s ‘pea protein’, which sounds good, doesn’t it, but what the hell is it? You’re treating peas with a number of complex, chemical reactions to extract some sort of beige powder. Keto, Paleo, fasting, vegan... this list of trendy modern eating regimes is never ending and opting to eat like a caveman or cut out the carbs makes it even harder to squeeze the correct nutrition into our busy schedules. Aussie newcomer Nüut (it's pronounced newt and is an Australian shortening of nutrition) aims to cover a broad spectrum of dietary choices with meals specially created to cater for Paleo and Keto followers - with the former packing a higher dose of protein and lower carbs, the latter sticking true to the ketogenic diet with low carbs and a hearty dollop of good fats. There is also a more generic 'daily balance' option, which is said to blend the key macronutrients found in a well-rounded meal. On top of this, it is GMO free and low carb, putting it in a separate league to familiar competitor brands such as Huel and Soylent. But look closely and you'll find a warning on the rear of the packet that states the powdered grub isn't a sole source of nutrition and should be consumed in conjunction with a nutritious diet and appropriate physical exercise. Instead, and much like its rivals, Nüut aims to offer a healthy 200-odd calorie snack or meal that's supposedly more nutritious than the naughty stuff you'd hastily grab from a shop or cafe. Finally, sustainability is a large part of the brand and every order will come with a recyclable envelope. This envelope allows buyers to post their empty sachets back to be recycled properly and efficiently. A quick peruse of the ingredients list reveals that there's a lot of organic pea protein going on here, while barley grass, wheat grass and chlorella also feature in its unique 'Superfood Blend'. Expect some Himalayan rock salt, coconut oils, pumpkin seeds and the usual long list of added vitamins and minerals - most of which are listed in chemical form, which can look a little daunting. The various formulas have differing amounts of protein, fats, carbs and fibre, with the Paleo version packing a whopping 23.5g of protein into a single drink, which should appeal to the gym-goers out there. Although the formula mixes very easily with water (there are very few lumps and bumps), the aftertaste is just bizarre. There's a hint of cacao in the Paleo packets, but this soon makes way for a metallic finish that clings to the back of the throat. None of the drinks mentioned here are particularly enjoyable but it's possible to grow to accept Huel and Soylent as part of the daily routine, with the slightly odd flavours and textures becoming fairly palatable after a while. The same can probably said for Nüut, but it's difficult to get over that aftertaste and there's currently no option to opt for an unflavoured version, which could be mixed with berries or a shot of espresso to make it slightly more enjoyable. Julie Silver, a qualified nutritional therapist and author of Food Awakening – Nutrition For NOW!, says: "After studying the ingredients in all of these powdered meal products, I would find it very hard to recommend both Huel and Soylent, as I don't find all of the ingredients to be healthy. "That said, I think Nüut contains a wider array of healthier ingredients and beneficial nutrients on the whole. "I say this because I noticed the other products contain a lot of Soya protein, which tend to be heavily processed and is not ideal because it stops iodine from being absorbed by the body. "Similarly, Xanthan gum is used as a thickener and it's not as healthy as people think it is. Sucralose is also an artificial sweetener that has negative health implications. "If you really can't face a wholesome well-balanced meal, it may be better to make up your own blend with natural protein powders, such as organic pea protein, rice protein and almond protein. Then mix this with any other powdered nutrients, such as chlorella, that doesn't have unnatural fillers and ingredients," she adds.